University of Sydney vice chancellor Michael Spence shared his excitement for the new campus on the way at the world-class Westmead Precinct. The University of Sydney has partnered with the NSW Government to establish a second campus as part of a leading international health, education and research precinct in Western Sydney. Premier Gladys Berejiklian said bringing the top-tier university to the heart of Western Sydney would attract more than 25,000 students and further drive its vision for a world-leading health and education precinct. The NSW Government announced it would be working with The University of Sydney after a three-month market sounding process. “The University of Sydney has the academic and reputational excellence to anchor this world-class education precinct, which will inspire and work hand-in-glove with co-located health facilities and ground-breaking medical research,” Ms Berejiklian said. Health Infrastructure chief executive officer Sam Sangster, Member for Parramatta Geoff Lee, NSW Premier Gladys Berejiklian, NSW Health Minister Brad Hazzard, Westmead Institute for Medical Research chief executive officer Tony Cunningham, UrbanGrowth chief executive officer Barry Mann and Western Sydney Local Health District chief executive officer Graeme Loy. New primary and high schools will also be included in the precinct planning. Over the next 30 years, the NSW Government’s vision for the precinct is expected to create more than 20,000 new jobs, inject more than $13 billion to the NSW economy and generate $3 billion in exports. “The precinct will attract the best and brightest to Westmead and continue the jobs boom in Western Sydney,” Ms Berejiklian said. Health Infrastructure chief executive officer Sam Sangster, NSW Health Minister Brad Hazard, Member for Parramatta Geoff Lee and NSW Premier Gladys Berejiklian and University of Sydney vice chancellor Michael Spence. 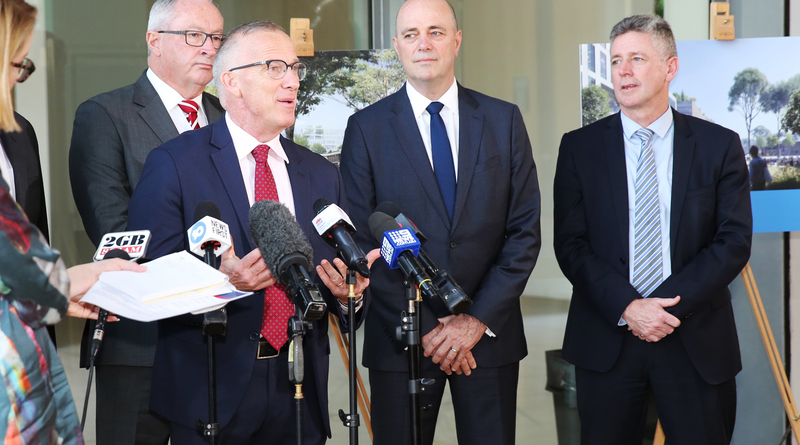 Health Minister Brad Hazzard said the NSW Government’s $1 billion Westmead Hospital Redevelopment – one of the biggest health projects in NSW – will transform health care in Western Sydney and beyond. Vice-Chancellor of The University of Sydney, Dr Michael Spence AC, said the campus would have more than 25,000 students and 2500 staff by 2050 and provide affordable accommodation for key workers and students. “Over the next 10 years, the campus would create 450 science and research jobs at the University and 3500 jobs in healthcare, education, biotechnology, manufacturing and other high-value industries. It will also enable hundreds of millions of dollars in third-party investment in local research and development,” Dr Spence said. NSW Premier Gladys Berejiklian at the announcement this morning. Member for Parramatta Dr Geoff Lee said he was delighted with this vision for Western Sydney. “This will not just be a world-leading medical, education and innovation precinct, but it will create a wonderful, dynamic and vibrant place – a place that also preserves and showcases our heritage,” Dr Lee said. Health Infrastructure NSW and UrbanGrowth NSW Development Corporation will now jointly lead a 24-month exclusive negotiation period with the University and community feedback will be sought during the master planning process.